In April of 2010, Arts Visalia partnered with the local Tulare-Sequoia Gourd Patch to present Containers of Our Culture, an exhibition of basket weaving and gourd art. The exhibition served as an extension of a weekend of workshops and presentations of the same name which was held here in Visalia at that time. 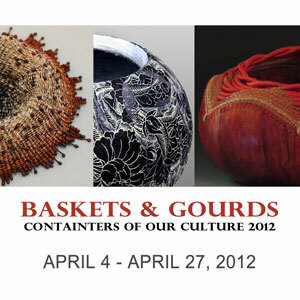 This month, we see the conference return to Visalia and we are once again hosting a major exhibition in support, this time titled Baskets and Gourds: Containers of Our Culture 2012. The artists whose works are on display in the exhibition include some of the most widely recognized practitioners of these traditional art forms and include almost all of the workshop instructors for the conference. Gourd and basket artists from throughout California and, in fact, throughout the United States, will be descending upon Visalia in order to study the techniques of these contemporary masters of gourd art and basketry. The craftsmanship displayed in the works on display is stunning, to say the least. While overall the artworks represent a direct connection to a variety of historically significant, traditional methods of art, they also demonstrate a contemporary approach in many of the pieces. Of course, these are living art forms and, the individual artists continue to adopt and employ new materials into their traditional techniques. Utilitarian objects remain a product and are well-represented, but so too many of the artworks are made strictly with aesthetic concerns in mind. In all, it amounts to a stunning exhibition with much to offer viewers. The exhibition will be on display at Arts Visalia through April 28th, although our public reception will not be held on our usual First Friday schedule. Instead, the reception will take place on the evening of Friday, April 20th, from 6 to 8pm. As always, attendance is free and open to the public.